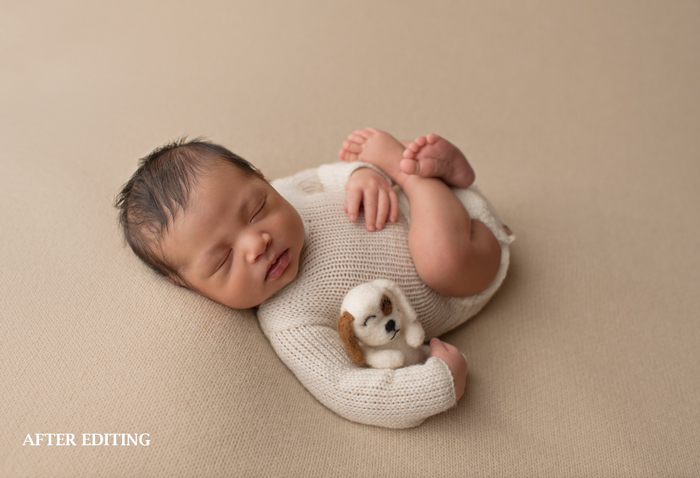 I am a professional newborn photographer in the Washington, D.C. area (Silver Spring, MD) specializing in custom fine art newborn and children’s portraits. 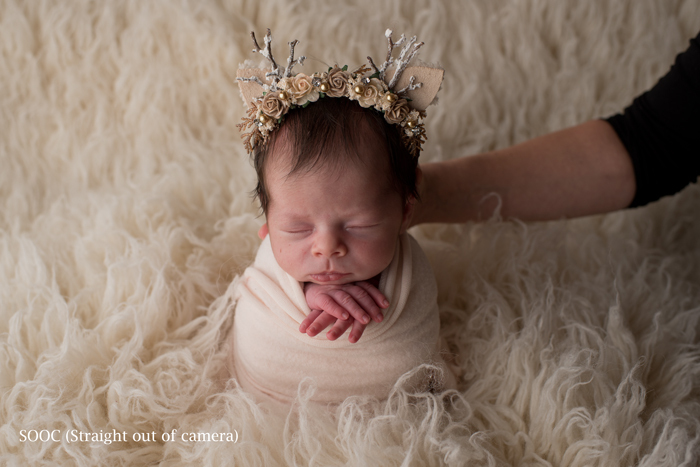 As most of you would likely surmise, that means that I get to spend a good deal of my time snuggling and photographing brand new babies. (Best job ever!) What might be less obvious, however, is the fact that I actually spend far more time each week engaging in behind-the-scenes work than I do pressing the shutter button on my camera. 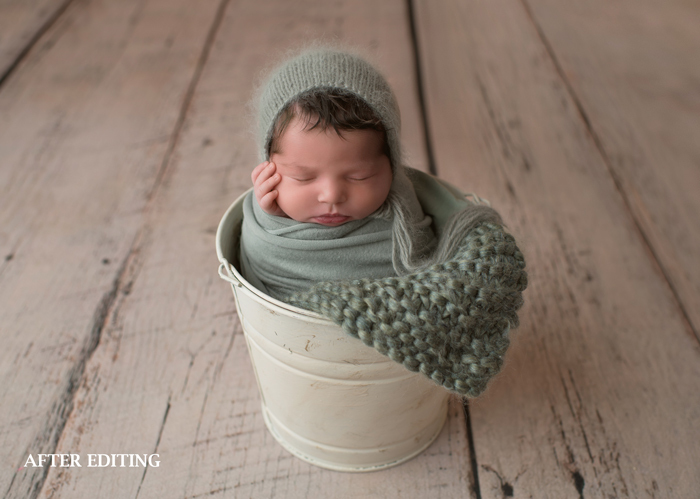 Wholly separate from the plethora of responsibilities associated with running a small business — which is a topic for another blog post — there is quite a bit of “invisible” work that goes into creating the newborn portraits that I ultimately deliver to my clients, ranging from the styling and set up for each session to the final editing and retouching of images. A few days ago, I was having a conversation with a non-photographer friend about my work schedule, and she expressed surprise regarding the amount of time that I devote to each of my portrait sessions and, particularly, to the post-processing of images from each session. 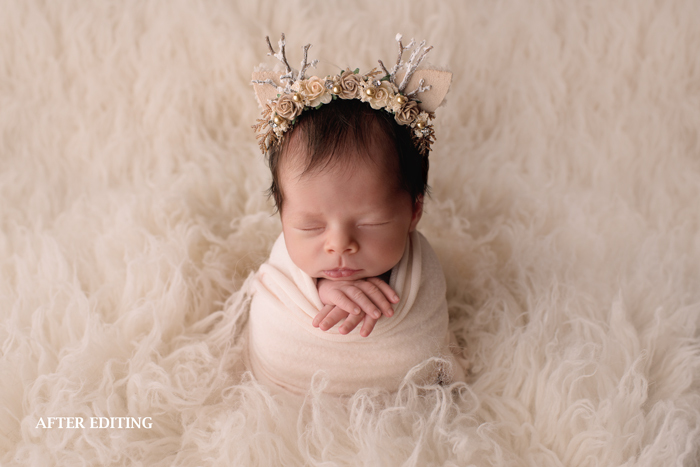 It occurred to me then that there is no reason why anyone other than a newborn photographer would be familiar with the work associated with editing and retouching newborn images. 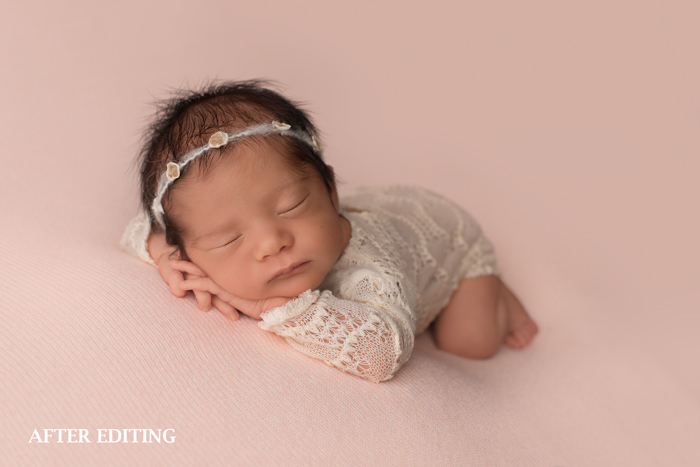 After all, many moons ago, before I was a photographer, I just assumed that photographers could upload images to Photoshop, push a button, and voila – perfect portraits! I was pretty disappointed to learn that Photoshop doesn’t actually work that way. 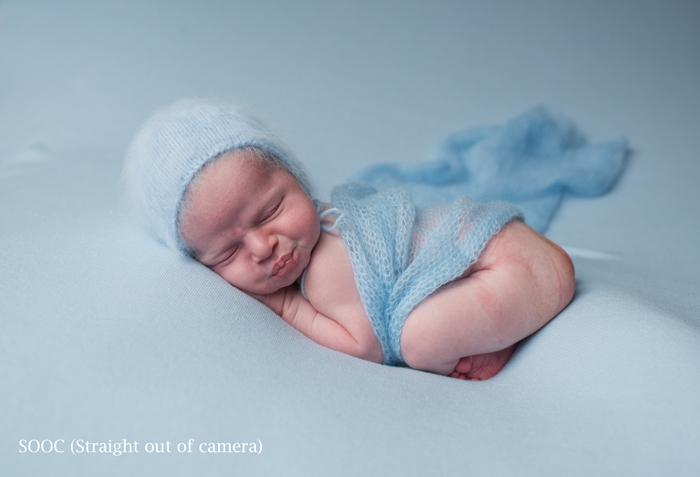 In any event, I thought that some of you might be interested in a little behind-the-scenes peek into the world of newborn photography retouching. Depending on the extent of retouching required, I might spend anywhere from 5 minutes to 40 minutes editing one single image! Why? 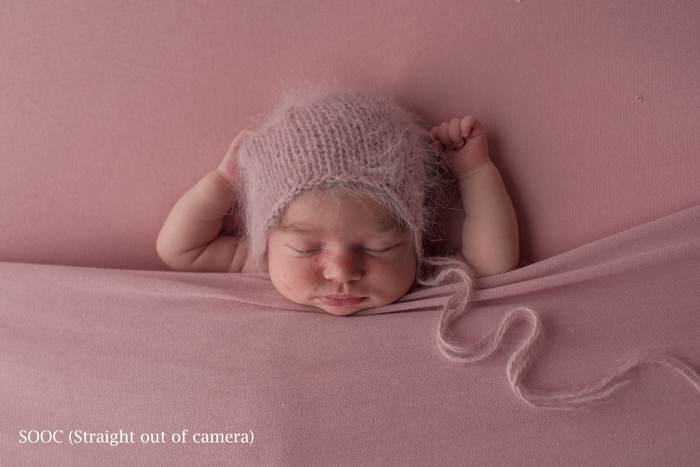 All newborns are perfect, but NO newborn has perfect skin. 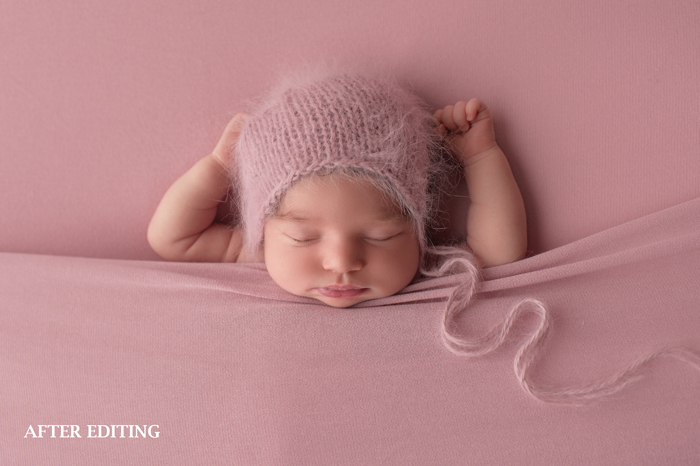 The vast majority of newborns have uneven skin tones and areas of redness or splotches; many have acne or eczema; many have flaky skin. 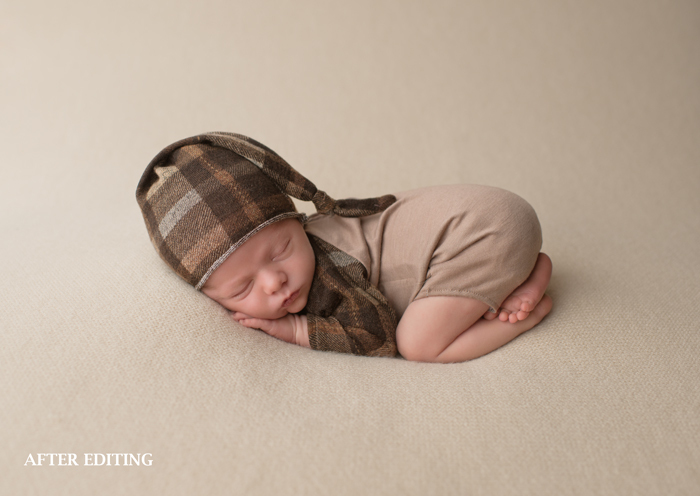 And newborns quite commonly have tiny fingers and toes that, while impossibly adorable, are also shades of purple, red, and gray. And, on occasion, I might go just a little bit crazy with my camera angle, and need to correct the image accordingly (including extension of the background). 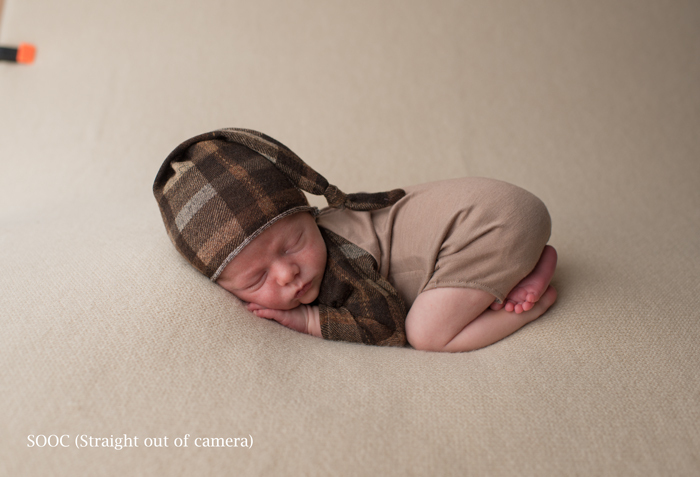 In addition, little fixes — such as the removal of visible portions of a baby’s diaper — are often required. 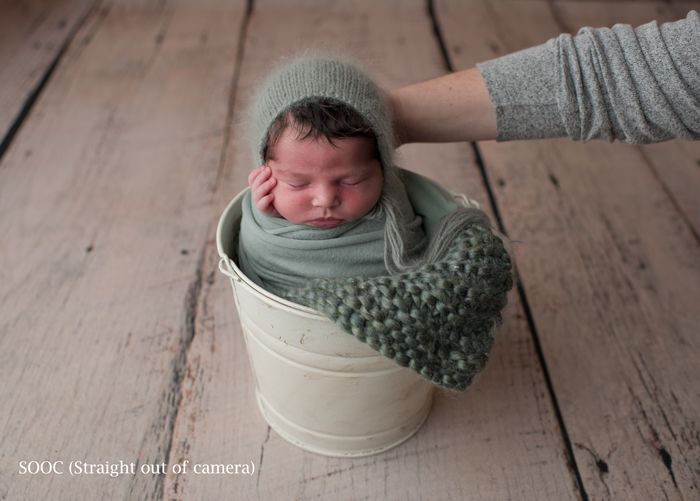 Although I try to ensure that everything is as close to perfect as possible before I push the shutter button to capture the photo, sometimes a correction during the session isn’t worth the risk of waking the baby. Diaper lines imprinted on baby’s skin! And, finally, there are particular poses and particular situations in which I have an assistant monitor or support the baby for safety reasons. 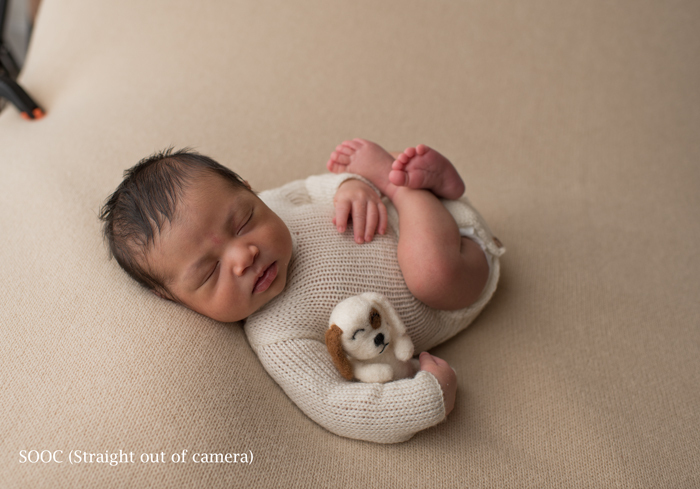 As should be the case with any newborn photographer, my absolute highest priority during any newborn session is the safety of the baby. 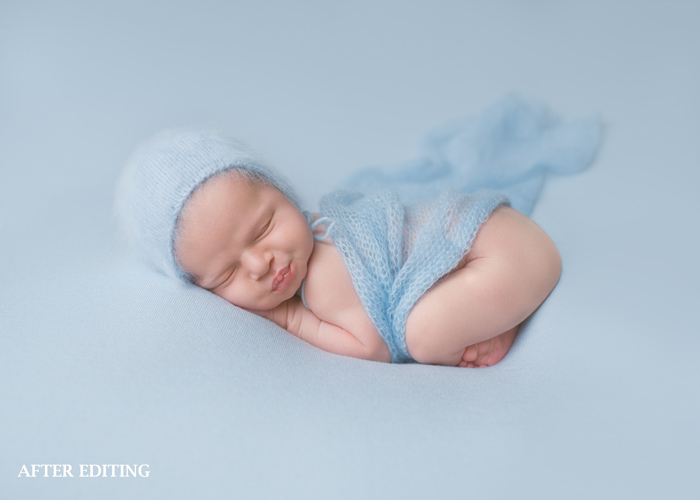 If you enjoyed this glimpse into newborn photography retouching, leave me a comment below! If there is any interest, I may share some additional behind-the-scenes posts! Great post! 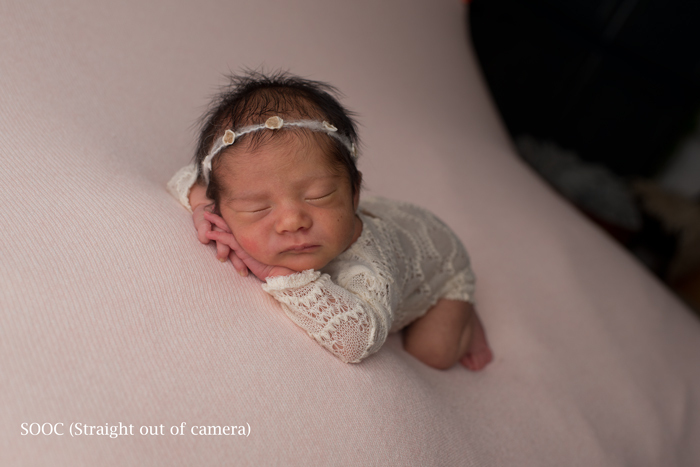 Good to know I’m not the only one spending 30min per newborn image. Worth all the work, your images are beautifull!